depending on your internet browsing program. For Some Books by John F. Wickham, S.J. that continue the research into and application of the Spiritual Exercises to our present situation in history click here. Here is a practical manual from Progressio that represents a current and updated format for directing the Spiritual Exercises of St. Ignatius. 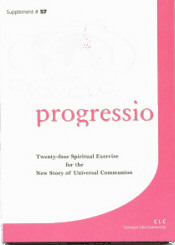 The spiritual exercises in this manual are presented within the context of the present concerns of the human family. As well as the expected dynamic and flow of the Exercises text, it includes two current dimensions of contemporary spirituality -- ecology and community. She goes on to write that ecology and community are two interlaced dimensions involved in the Ignatian principle and foundation. "Everything is for God and by God. God is present in all things, and all things are present in God... "
Spiritual Intimacy And Community: An Ignatian View Of The Small Faith Community by John J. English, S.J., originally published in 1992 by Darton, Longman and Todd Ltd., London, is available through B. Broughton Co. Ltd., 2105 Danforth Ave., Toronto, Ontario, Canada M4C 1K1; Phone 416-690-4777; Fax 416-690-5357. In Canada, Broughton's can be reached toll free at 1-800-268-4449. Their website with further info is: http://www.bbroughton.com. This book reclaims the communal as the basic dimension of Christian and human living. This book brings together John English's expertise in the Spiritual Exercises with his own experience of small faith communities both as participant and as facilitator. He focuses on the ongoing process of discernment undertaken by small groups of Christians who are discovering the significance of their unique corporate identity. He offers guidelines through the stages of self-discovery and decision-making as communities seek to recognize and follow their own particular call to serve God and humankind. All those who are involved in communal Christian ventures but are uncertain how to relate the personal and communal dimensions of their Christian faith, will find here a guide who is enthusiastic, well-informed and challenging. It is a very important book. "It nudges our emphasis on ourselves as individuals in the direction of seeing ourselves as members of a community, indeed as members of the human race. John English wants us to move from an 'I' relationship with God to a 'we' relationship. He demonstrates the importance of reflecting on the communal in every discernment process which concerns itself with 'my' personal salvation and 'my' search for the will of God" (Patrick Purnell, SJ.). Choosing Life: Significance Of Personal History In Decision-Making by John English, S.J., originally published in by Paulist Press in 1978 is now available through B. Broughton Co. Ltd., 2105 Danforth Ave., Toronto, Ontario, Canada M4C 1K1; Phone 416-690-4777; Fax 416-690-5357. In Canada, Broughton's can be reached toll free at 1-800-268-4449. Their website with further info is: http://www.bbroughton.com . This book is about developing a deep personal awareness of how God has been present and working within one's life. This deep awareness is itself a spiritual consolation. This spiritual consolation can be a touchstone for discerning significant choices. This book uses the Spiritual Exercises of St. Ignatius as a starting point for appropriating one's unique personal history in faith. It is the author's belief that an awareness of one's personal history brings consolation that is of great significance when making a significant Christian decisions. The author uses his own history as an illustration of this process, and offers examples and exercises for those who desire to grow in this awareness of themselves. Choosing Life is designed especially for spiritual guides familiar with Spiritual Exercises and other prolonged prayer experiences. It can also be used profitably by others in touch with God's movements in their own lives. Such persons will find the exercises and reflections in this book very helpful for growth in the awareness of their own personal faith history. This is an important work for persons seeking a greater interiorization of their faith and a means of making authentic Christian decisions.